We're wrapping a few top stories and our best bets from the past week! Check back weekly to catch up with what's happening in horse racing. After months of programming, our new Android App was finally launched in the Google Play Store. 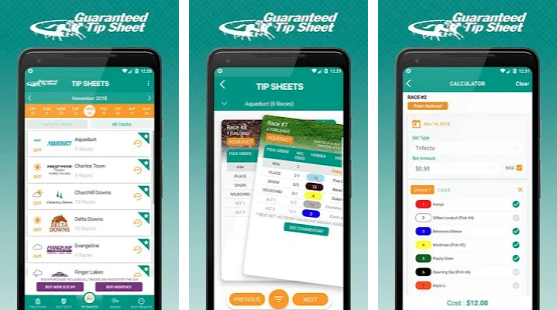 The new app has a fresh re-design and tons of new features including easier to read and use graphical interface optimized for phone and tablets, weather conditions and local temperature for each track, each race graphically displays track surface (dirt, turf, all weather), choose Flip or Scroll type tipsheet view, Share-A-Sheet - share your tipsheet purchase with a friend at no additional cost, list tracks by geo-location, those physically closest to you are listed first if you choose, see graph of our top performing tracks over the last 14 days, desktop widget that shows the top performing tracks over the last 14 days and much more. Check out some of the screenshots below. Apple version coming next week! MONOMOY GIRL'S connections have announced that they will be skipping the Pegasus World Cup in January. The Breeders' Cup Distaff winner will be taking two to three months off and will prep for the $700,000 Apple Blossom Handicap (G1) at Oaklawn Park on April 14th. Get Your Triple Crown Tickets Now! Kentucky Derby Ticket Pre-Sale starts today, November 15th for pre-registered customers. Today you are able to start purchasing your Kentucky Oaks (May 3rd) and Kentucky Derby (May 4th) tickets. All seats are sold as a two-day package with a limit of 6 tickets per household! Prices start at $416 for grandstand bleacher seating and up to $7164 for covered box seating. Boxes must be purchased in sets of 6 seats. Preakness Stakes tickets can also be purchased online now as well at www.preakness.com. Prices start at $40 for facility admission to $720 for luxury seating. Belmont Stakes tickets are not yet available, but you can sign up for pre-sale notifications now online at www.belmontstakes.com. The richest New York bred in history, MIND YOUR BISCUITS, has been officially retired as of November 14th. The multiple stakes and Grade 1 winner will be sent to Shadai Farm in Japan to stand for the 2019 breeding season. Coming off an 11th place finish in the Breeders' Cup Classic, trainer and co-owner Chad Summers said the colt wasn't showing the enthusiasm to work that he once had. We had a hot day at Evangeline on Wednesday. Hopefully you were able to cash in on Race #7 paid $653.20 on the 8/3 Exacta and $4,089.20 on the 8/3/6 Trifecta! Total payouts for the day at Evangeline was $5,719.30. Who says 13 is an unlucky number? On Tuesday, November 13th, we identified 18 Best Bets for the day across six tracks. One scratched out of their race, leaving 17 runners. Of those 17, we had eight winners (47%), six that finished second, one third, and two that ran out-of-the-money. In total, 15 of 17 ran in-the-money for an astounding 88% and the average winner paid $4.61. If you played the ponies with our picks last Friday, November 9th at Will Rogers Downs, the first two races were winners paying a 15X profit! Race #1 Will Rogers $7,200 Maiden Claiming paid $589.60 on the Exacta Box and $772.00 on the Trifecta Box. Race #2 Will Rogers $7,200 Maiden Claiming paid $73.80 Exacta Box. Gulfstream Park West started off the season strong with 9 "Millions" stakes races. While there were many great horses running and fighting to keep their titles, you couldn't help but notice that jockey Paco Lopez was hot! Lopez won five stakes in one day and was honored as Jockey of the Week. Lopez had rides in all 11 races. Out of the ten stakes races, he won five including the Turf Preview on GALLEON MAST, the Sprint Preview on KROY, the Millions Classic Preview on MR. JORDAN, the Juvenile Fillies Sprint on LOVESICK and the Juvenile Fillies Turf on VOW TO RECOVER.